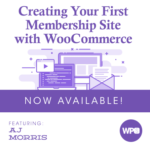 AJ Morris is the Product Manager for Managed WooCommerce Hosting at Liquid Web, where he focuses on assisting customers with their eCommerce needs. Liquid Web is leading the charge in Managed WooCommerce Hosting, building innovating solutions to help store owners run their business without needing to get into the technology side of running their site. When not working, AJ enjoys spending time with his family, traveling and spending the weekends at the lake.